A list of places that are worth visiting for natural or cultural purposes on Valeyne. Located twelve heks north of Gaòlvan in the Eastern part of Denmòrik the Chocolate Pools, or Xoýlaýln Miwrarn as they are known locally, are a series of small lakes in the jungle which, for three months every year at the end of the wet season is filled with a sweet substance which comes from fruit similar to cacao beans, but with an added sweetness. After falling from the thick clusters of Miwrarn trees surrounding and partly growing on the small lakes the Miwrarn fruit hit the bottom of the lakes releasing their seeds and slowly fermenting. The rotting fruit combined with the clean waters of the lake make a slightly alcoholic beverage known as Miwgànàigh which resembles chocolate in taste and texture. You can get to Xoýlaýln Miwrarn by bus from Gaòlvan to the village of Xoýlepek and then walking to the pools. Gaòlvan has a train connection from Uptallà. You can get to Tureddin i Amanaste from Skai, Nebverdene and most other ports in the north of Inbud. The Pillars of Heaven or Tureddin i Amanaste are two large windswept pillars of rock jutting out of the seabed just north of the Lavran island of Inbud. The first Kneian settlers sailed through these pillars under Captain Vair u Lar entering the Lavran Archipelago from the West hence their second name Lavrahen Vámeni, or Lavran Gates. The Pillars are a popular tourist attraction and can be viewed either from the shore or from ferries which sail from most north-western ports on the Island of Inbud. The Fort of the Iron Guard is a huge star-shaped fort located on the outskirts of New Epan in Xencie. It was built in 1698 by the Enterdese Navy as a naval battery. The Colonial Iron Guard, an elite Enterdese marine infantry force was stationed there until 1819, when it was replaced by the Colonial Marines. It was constantly raided by pirates from 1710 until 1796 but was never captured. In 1986 it was renovated and converted into the New Epan Museum of Arms and was opened to the public. You can get to the Fort of the Iron Guard by bus or metro from New Epan city centre. 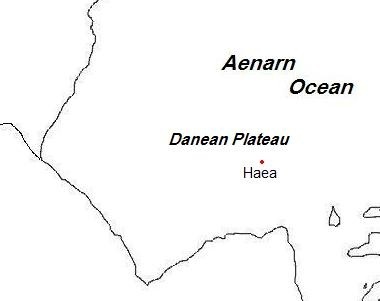 Haea, located in the Danean Plateau region of the Aenarn Ocean is a city built entirely off land. It stands on huge stilts protruding out of the seabed in a shallow area of the ocean. Designed and built in 2027 by a multinational team, it now has a population of over 100.000 and is powered by geothermal power plants using energy from magma vents on the sea floor. It houses the largest underwater aquarium on Escodrion which has a direct link to the ocean so the marine animal life can come and go as it pleases.